Welcome to the next installment of the Choose Your Own Black and White Printables series. For those just joining us here’s the run down. Each week I’m sharing black and versions of existing printables. The series will run until the requests stop coming in or I run out of printables to convert. 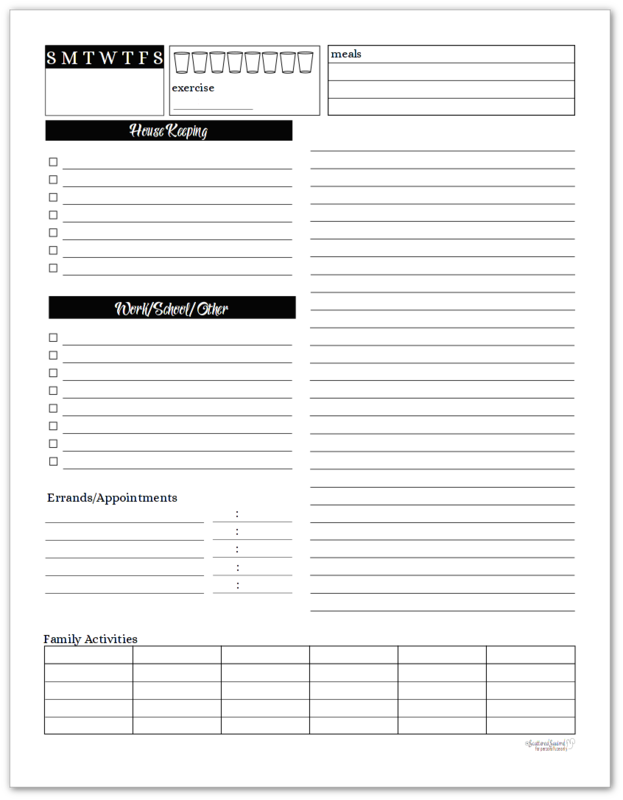 If there is a printable (or many printables) that you’d love to have a black and white version of, just click the link above to fill out the form and submit your request. 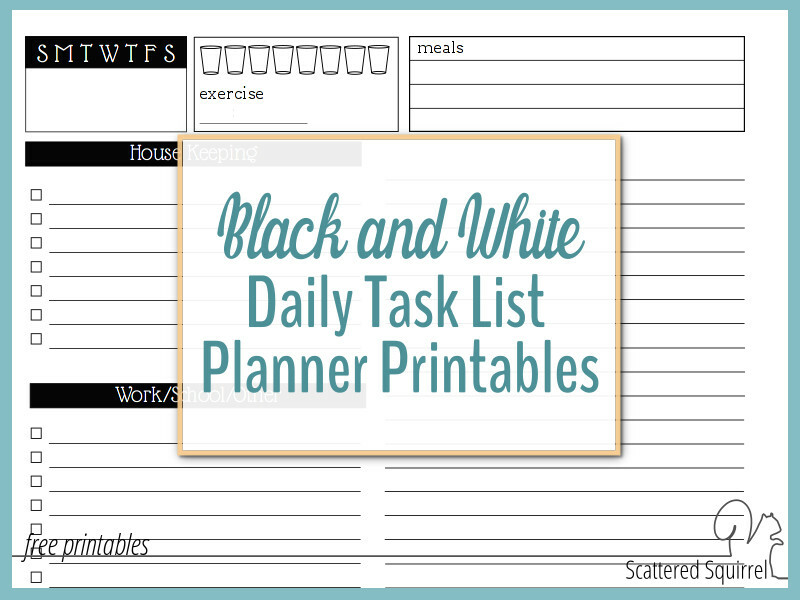 This week is the black and white daily task list planner printables and I have to say, they turned out fantastic! 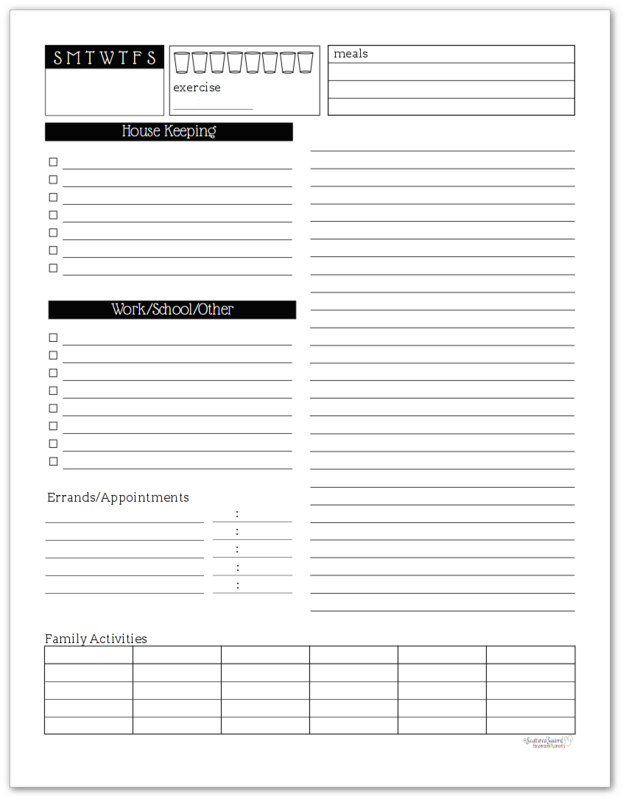 These task list printables are handy ones to have on hand. I can’t count the number of times I’ve pulled one out to help me organize a busy day. There is something so calming about organizing my to-do list and seeing everything neatly arranged on paper that helps me to focus. More importantly, it helps combat those feelings of overwhelm that can sap away your energy. Even if you’re a dedicated weekly planner like me, having a couple of this tucked into the back of your planner can be a sanity saver. These task lists were created to break down busy schedules into categories that help to plan out the day a little better. There’s space for checklists, errands and/or appointments, family activities, meals, water and exercise log, and then a space to customize as you need it. My favourite feature of this prinable is that blank lined section on the right. It offers a lot of versatility. Sometimes I use it to break my day into half-hour chunks of time, and other times I use it as a place to jot down my shopping list. I love that I can adjust it as I need too. Pictured above is the Sunshine Skies version and below you’ll find the Understated Rainbow. Both of these are the full-size ones. I also really like the top three sections. Having a place to mark the date is always a handy feature, especially if you need to start your planning a few days ahead of time. I also really like the reminder to make sure I’m drinking water and that I take time to exercise. It’s easy to overlook some of these self-care tasks when we’re busy. For that same reason I like having the spot to jot down the meal plan for the day. Since busy days usually mean I’m looking at my planner more often, it’s nice to have that reminder there all day. The half-size versions didn’t any layout changes. Above you’ll find the Understated Rainbow version and below is the Sunshine Skies. Daily planner pages are a staple in all of my planners for so many reasons, but that’s could be a whole post in itself. For now I’ll leave you with what I consider the top three benefits to using a daily planner. While many weekly planners offer enough room to plan busy days, they can start to feel overwhelming when you see nothing but a full schedule. Daily planners offer a visual break from the busy-ness. They allow to focus on one day at a time, and sometimes that can be the difference between feeling crazy and frazzled and feeling like you totally got it covered. 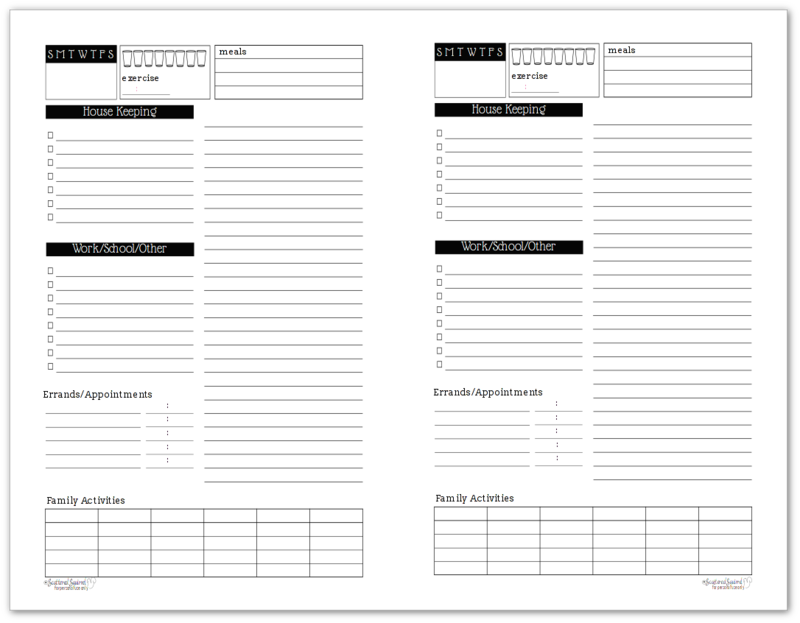 Daily pages like these black and white daily task list planner printables can help you break your busy days down into manageable chunks. Categorized to-do lists allow you to see what life areas are going to need the most attention and help you plan accordingly. Sometimes having a little extra planning power can be a good thing. Now it’s your turn! Are you a weekly planner, a daily planner, or a bit of both? Drop me a line in the comments below and share your thoughts. I’d also love to see how you’re using the printables. If you share pictures of them on social media, I’d love it if you tagged me or used the hashtag #scatteredsquirrelprintables so I can check them out. Thank you so much. I’m happy to hear that you like it!